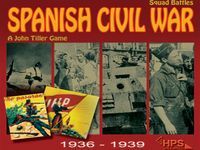 This game of Squad Battles focuses on the Battle for Madrid, with all its initial staging, after the Army of Africa is transported onto the mainland and slowly advances towards Madrid to connect with the nationalist forces coming from the North. It also includes the successive battles aimed at encircling the capital and the ensuing Republican counter-offensives. It presents the gamer with a wide spectrum of battlefields and of different troop organizations, from the early columns to the later armies. It also takes the gamer to other locations where combat was intense, such as Teruel (the Stalingrad of the SCW) or the banks of the Ebro and its surrounding mountains.